You can see that this example is British because of the style of the front plunger brake and chainwheel. 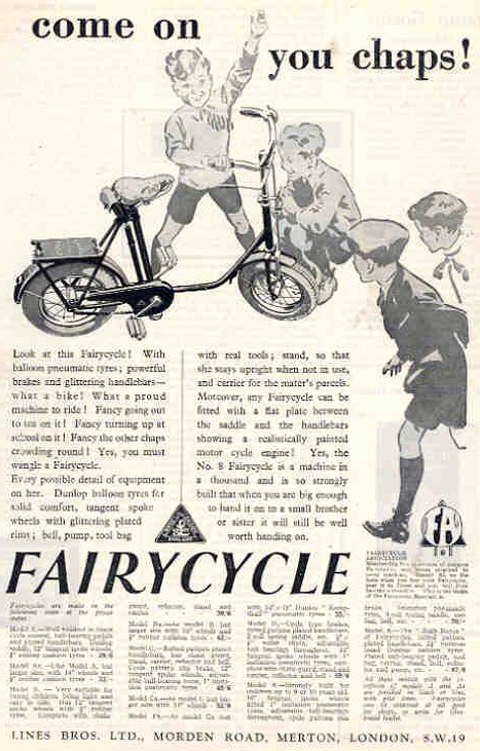 BSA used a similar chainwheel for its Junior range of bicycles. The double down tube is interesting because the top tube is narrower gauge. Adult ladies’ bicycles with a double down tube became popular in the 1930s. Another interesting detail is the chain stays, which have a pronounced curve between the bottom bracket and rear axle. This is mirrored in the curve of the seat stays. This fairy cycle has been well cared-for, and was restored by its previous owner.